Strange, dark, meditative, dreamlike. The narrative itself evokes the maze; at times sad, at times hopeful, mostly a bit of both. It feels somehow incomplete, as if it's more of a series of vignettes than a story, or as if the character who seems like the protagonist is actually just a side character, a Rosencrantz (or Guildenstern), seeing only bits and pieces of the main narrative. That sense of incompleteness is, of course, what it's like to live in the maze. It's all a metaphor, of course. I don't know why it's only getting three stars: maybe because it made me feel sad and I'm not sure I'll read it again. Maybe because of the women raped and cats killed and other things I wish hadn't happened, even though I know that is how I am supposed to feel about them. It's definitely #LossLit, and given that I picked it up via M. John Harrison, I am not at all surprised. 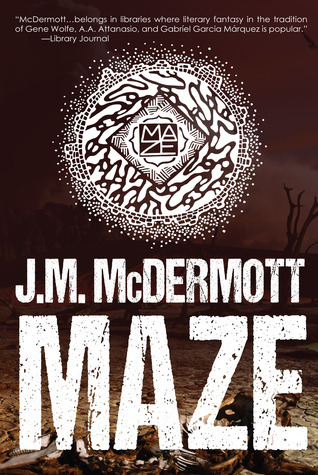 Sign into Goodreads to see if any of your friends have read Maze.